← 4 Crazy Chip Flavours! You’re going to have to bear with me, internet. I want to talk about Monster Hunter again. Let’s begin with the basics. 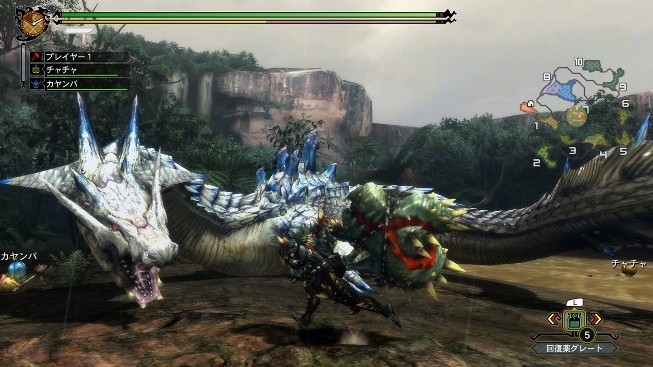 The Monster Hunter series is all about fighting giant beasts, and is pretty much a game built around hectic, exciting boss battles. Yes, it includes some smaller enemies too, but they’re like the basil on the tomato soup that is the rest of the game: they add a little flavour, but aren’t what you came for. You’re there to bring down huge, fearsome beasts and then turn them into pants. It’s even more fun when you’re doing it with your friends, so much so that it’s the only video game that I actually have a desire to play with people online. Victory in Monster Hunter requires what I call the Three P’s: preparation, patience, and practice. It’s not a game for people who can’t be arsed to earn their victory. There is no coasting in Monster Hunter, and there is no easy mode. If you’re going to win, you need to make sure you know what you’re doing. Triple-checking your supplies before you head out on a hunt isn’t just helpful, it’s nearly required. You need to study your enemy’s movement and attack patterns to find weaknesses and openings. Familiarity with the terrain in each map is just as important as being familiar with the strengths and weaknesses of your chosen weapon. Long story short: Monster Hunter requires a huge investment of time and effort on the player’s part, and that’s what I love most about it. Most games, especially those of the current generation, you can just turn on and play if you’ve got even a basic knowledge of video games. Monster Hunter is not at all like that. If you boot up a Monster Hunter game and expect to get just another action game, you’ll be eating a healthy serving of humble pie in no time. These are complicated games, and you need to take the time to learn them before you’ll get anywhere. Each game starts with a rather lengthy tutorial in your basic survival skills like item gathering, meat cooking, and small monster slaughter before you even get a whiff of a real hunt. While these might seem like boring little subsystems that aren’t so important that they need to be forced on you, it turns out that they are absolutely essential. While I said there’s no easy mode in Monster Hunter, MH3U does make a a few little concessions to help ease new players into the game. For one, you don’t start off buck naked like you do in Tri. You’re given a basic set of armor and the most basic version of each weapon type. You also get a base defense stat of 50 as opposed to zero, which helps to tone down the damage you take in the early game. It’s basically a godsend for new players, and helps vets burn through the easy stuff to get to the tougher, more interesting monsters a bit faster. After you get yourself accustomed to the life of scrounging for your potion materials and turning relatively harmless animals into delicious steaks, you’ll suddenly be thrust into the actual game. If it weren’t for the free armor and defense boost, the kid gloves would come off immediately. The first large monster that you’re likely to face off against is Great Jaggi, a big orange and purple dinosaur that resembles a beefier take on Jurassic Park‘s version of a dilophosaurus. 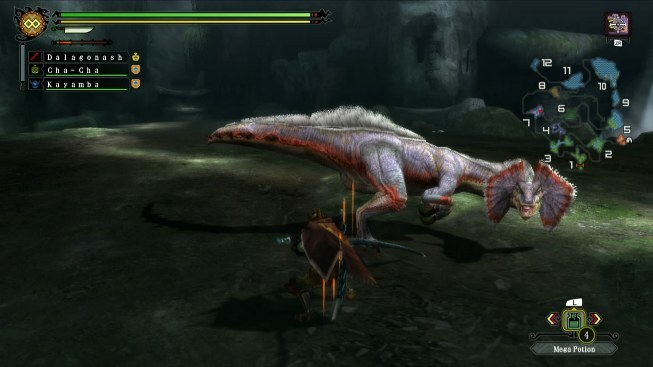 It only has maybe four different attacks, but it is a very speedy foe, and can easily run circles around your hunter. This is when you start to notice just how slow you really are. Yes, maybe it started to dawn on you while you were beating up small monsters that your dude/chick is kind of slow. I mean she/he’s pretty agile normally, but once you draw your weapon things change up drastically. Both your hunter’s movements and the actual control scheme change when your weapon is drawn, and knowing what you can and can’t do in each state is the real first step towards a successful hunt. The game does try to take the edge off by defaulting you to a Sword and Shield, which is one of the more nimble weapon classes, but god forbid you try to begin your huntering career with a Great Sword, Hammer, or even worse, a ranged weapon. There are 12 weapon classes to choose from, divided into two categories: blademaster and gunner. They all play very differently, and you’re free to experiment with them all to your heart’s content, but I’m stuck firmly in the mastery of the Switch Axe, a weapon that can swap between the form of an axe and that of a sword. While it may seem like a redundant transition, the axe and sword forms handle and play very differently, and allow you to accommodate for various situations with a single weapon. 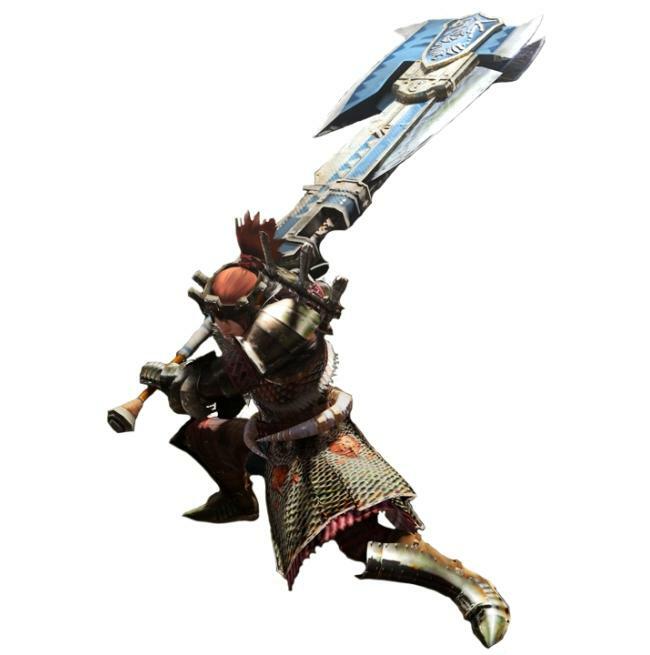 For example, the axe form is quicker, and allows for more opportunity to pile on a long chain of attacks. The sword form, while a bit slower, hits harder and carries with it a special effect like causing extra elemental damage or inflicting poison, which varies between each different model of Switch Axe. Every weapon has its own learning curve, and at the beginning they can seem unreasonably steep. The quicker weapons like Dual Swords give you the added bonus of mobility, but are considerably weaker than the bigger, slower weapons, meaning that it can take a lot longer to bring down a monster. When you’re wielding one of the big weapons, you need to know your enemy and when there’s an opening in his attack patterns, because you likely aren’t going to be able to get many hits in before it counterattacks or bounds away. The Hunting Horn is it’s own weird kind of thing, as given it’s ability to bestow status buffs on hunters, is usually better off used by a support player on a team than by a solo hunter. Gunners get physical range a wide variety of special ammo to choose from, but have to deal with aiming and the reduced defense of gunner-specific armor. Yeah, they can keep a farther distance from the danger, but when they take a stray hit, it hurts considerably more. Figuring out a strategy for your weapon of choice is where that “patience” thing I was talking about factors in. Every attack you make is deliberate and leaves you open. There isn’t a single weapon available where the optimal strategy is to run toward your target like a maniac. No matter what kind of weapon you choose, you’ll always have to learn when it’s best to attack, and when you should keep it sheathed and focus on defense and/or evasion. Even once you’ve gotten the basic feel for a weapon type, a new monster can show up and give cause for you to completely revise your battle strategy. No one weapon is optimal for fighting every monster, but every weapon type is capable of victory against any monster if you put in the time to learn how it works, where its strengths lie, and when the best time to use it is. Figuring out your preferred weapon and mastering it is incredibly satisfying. Some people like to change it up and learn multiple weapons, but I can’t imagine ever leaving my precious Switch-Axe behind. I’ve reached the old trope of having “become one with my weapon” and it is a beautiful thing. Learning to control your hunter is only the beginning, though. There is a wide variety of monsters, and only with great luck will you achieve a clean victory against any of them on your first go. Even the weakest of the large monsters can give a hunter a run for his or her money if they aren’t sufficiently prepared. Take for example, the Rathian. I’ve always considered it to be the first major fight. Up until then you’re fighting dinosaurs and bears and big, scaly birds. But Rathian is different. She’s a massive, fire-breathing wyvern that can poison you and tear you apart with little effort. You can get by the other monsters up to this point by hacking away like a maniac and carrying a boatload of potions, but you can’t play that game with Rathian. You need to spend time seeing which attack she’ll use when you’re close, and what she’ll do when you put some distance between yourself and her. You need to learn her tells and commit them to memory. Her poisonous somersault attack will be the end of you if you don’t know how to see it coming. Even an experienced hunter can fall to her if they get lazy. And this is still in the early part of the game. I said before that knowing the terrain is just as important as anything, and I absolutely meant it. Rathian also happens to provide many good examples of why this is important. If she lights you on fire with a well-placed fireball, you’ll have to roll three times to put it out. But wouldn’t it be handy if there were a stream or pool of water nearby which you could jump into the extinguish it instantly? After all that fighting, she’s suddenly gotten hungry and has taken off in search of a food source to replenish her stamina. It would probably be a good idea to know what she eats and what part of the map it can be found in. Oh, hey, she’s limping away. That’s often a sign that a monster is retreating to its nesting area to get away from you and have a little snooze to try to recover. But do you know where that nest is? What about when an aquatic monster needs to rest? It’s probably not going to be flying up the cliffside or into a faraway forest clearing. 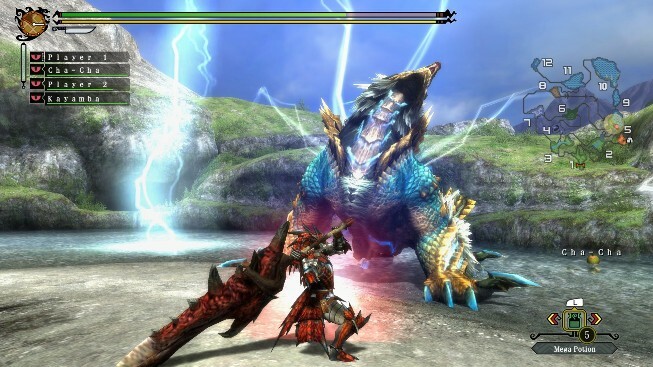 There are only six fully-featured environments in MH3U, but you need to be intimately familiar with them if you’re going to be successful with the “hunting” part of Monster Hunter. The single player game has easily doubled in length from Tri, adding several new tiers of quests and a few new minor plot lines. The story no longer ends once you’ve saved the village, oh no. Now, there is an entirely new branch of solo High Rank quests for you to tackle. What “High Rank” means is that you get to face the monsters you already know and love, but now they’re stronger and more durable. Add to that a range of subspecies (palette swaps) of those monsters, which can completely change the way you fight them, and even a few unique new monsters that are more than happy to tear you a new one. The fortunate thing is that you’re given the option to bring along two AI companions. They aren’t very strong, but they have an assortment of healing/buffing abilities and are pretty good at distracting a monster’s attention away from you. It’s also possible to outfit them with dozens of different masks, which can significantly change their abilities and how they support you in and out of battle. But the single player mode is just where you get your newbie feet wet in MH3U. The expansion to the solo mode makes it a lot meatier, yes, but the true face of the game only shows itself once you hop into the online mode and start huntering with others. The monsters here are a little more powered up throughout all ranks to compensate for additional hunters, but not so much that you can’t tackle them by your lonesome if you so choose. It’s just more fun to do it with friends. It’s also notable that the online section gets you up to the High Rank quests quite a bit faster than offline, and also offers the horrors of the fabled G Rank. 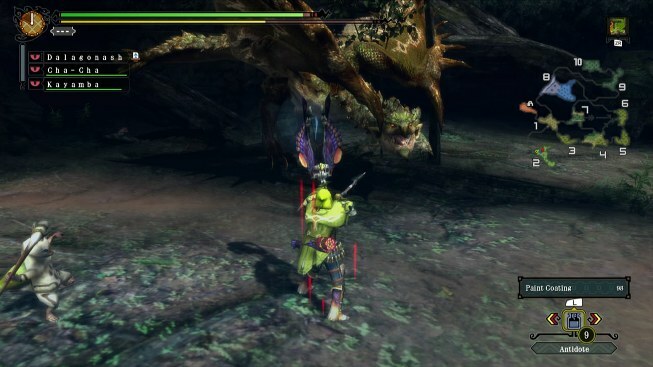 This is the ultimate in monster huntering. Not only are the monsters powered up even more, but some of them also learn some new tricks, and they can even scale in physical size. The most fearsome beasts are only accessible in G Rank, meaning that if you want to see all that the game has to offer, you have to know your stuff and have to skills to back that knowledge up with. Or join a group of vets online and hide in the corner while they do the heavy lifting. Keeping all the content accessible to everyone is super important because there is so much of it. Yes, you can see most of what the game has to offer through the solo mode, but there is so much more to see once you get to the online portion. To put the scope of the game into a certain context, I logged over 120 hours in MH3U before I finally unlocked the first set of G Rank quests. Now, I did dawdle a bit and cleared nearly all of the single player mode, but that’s still a lot of game for your dollar. Just think of how much more time is going to be spent on the section of that game that strikes fear even into that heart of someone like me, who is a die-hard MonHan fan. It’s also worth mentioning that I have enjoyed each and every moment I’ve spent with the game, unlike something like Skyrim, where a lot of the hours on display could be attributed to slogging through boring, samey caves and dungeons. 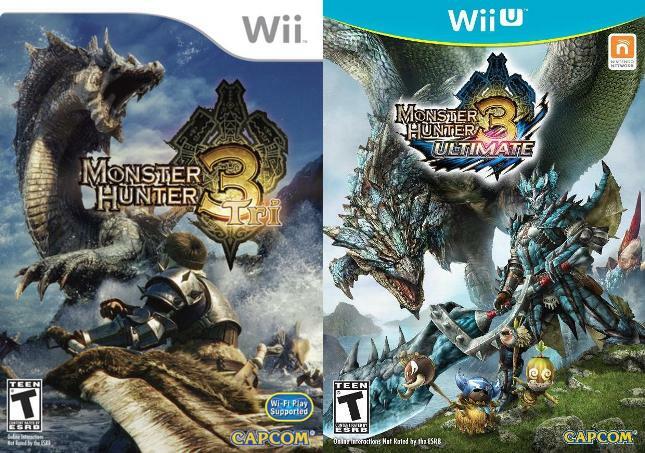 Monster Hunter 3 Ultimate is an absolutely thrilling experience, but it’s an experience that you can only get the most out of if you’re willing to work for it. Fortunately, that work in itself is pretty darn fun, and even when a monster puts you down for the count, you can come away feeling like you’ve learned something about the fight that you can use in the next round. Very rarely does the game throw something unfair at you; some fights might seem cheap at first and you may feel like you’ve hit a brick wall against some of the tougher monsters, but any obstacle can be overcome with a solid balance of preparation, patience, and practice. *NB: Stole all the images from other people via Google Image Search.